The following quotes are taken from Masonic and Theosophical literature each claiming some form of "works" or "special knowledge" as the key to perfection and Godhood. This-the evolution of the superman was always the purpose of the ancient Mysteries, and the real purpose of modern Masonry is, not the social and charitable purpose to which so much attention is paid, but the expediting of the spiritual evolution of those who aspire to perfect their own nature and transform it into a more god-like quality. And this is a definite science, a royal art ....." -W.L. Wilshurst, The Meaning of Masonry(Gramercy Books, 1922/1980), p.47. "Man is a god in the making, and as in the mystic myths of Egypt, on the potter's wheel he is being molded. When his light shines out to lift and preserve all things, he receives the triple crown of godhood, and joins the throng of Master Masons ..." -Manly P. Hall, The Lost Keys of Freemasonry (Macoy Publishing and Masonic Supply Company, 1951), p. 92. "It is far more important that men should strive to become Christs than that they should believe that Jesus was Christ. If the Christ - state can be attained by but one human being during the whole evolution of the race, then the evolution of man is a farce and human perfection an impossibility ... Jesus is no less divine because all men may reach the same Divine perfection." - J.D. Buck, Mystic Masonry and the Greater Mysteries of Antiquity (Regan Publishing Company, 1925), p.62. "Theosophy teaches that humans are God in person and a 'god' in the making." - Theosophical Society in Atlanta (www.theosophicalatlanta.org). "Man is not to be compelled; he is to be free. He is not a slave, but a God in the making..." - Annie Besant, Esoteric Christianity(Quest/Theosophical Classics, 1966), p.220. "For man's supreme aim should be to become God, and God is love ... We become one with the Supreme most surely when we lose ourselves in work for humanity." - William Q.Judge, Theosophical Articles (The Theosophy Company, 1980), pp. 385,388. "They[Perfected Men] tell us with one accord that no long time ago They stood where we stand now. They have risen out of the ranks of ordinary humanity, and They have told us that we in time to come shall be as They are now, and that the whole system is a graded evolution of life extending up and up, further than we can follow it, even unto the Godhead Itself." C.w. Leadbeater, The Masters and the Path (The Theosophical Press, 1925), pp.11-12. When I read these quotes from Masonic and Theosophical authors, immediately I am reminded of this verse from the Christian Bible. "Watch out for false prophets. They come to you in sheep's clothing, but inwardly are ferocious wolves. Matthew 7:15 NIV. Now contrast the quotes above with Biblical Christianity, which explicity states that Man's fall was in direct relation to the lie that we could become "as God". "Now the serpent was more crafty than any of the wild animals the Lord God had made. He said to the woman, "Did God really say, 'You must not eat from any tree in the garden?" The woman said to the serpent, "We may eat fruit from the trees in the garden, but God did say, 'You must not eat fruit from the tree that is in the middle of the garden, and you must not touch it, or you will die.'" The Bible also tells us that Mankind cannot save himself through self righteous works (useless rituals or obligations) Ephesians 2:8-9 KJV states, "For by grace are ye saved through faith; and that not of yourselves; it is the gift of God: Not of works, lest any man should boast." These words come to mind when I think of people involved in Masonry and the Theosophical movement. Jesus Christ stated," Woe to you, teachers of the law and Pharisees, you hypocrites! You shut the kingdom of heaven in men's faces. You yourselves do not enter, nor will you let those enter who are trying to." "Woe to you, teachers of the law and Pharisees, you hypocrites! You travel over land and sea to win a single convert, and when he becomes one, you make him twice as much a son of hell as you are." Matthew 23:23-15 NIV. Very strong words from our Lord and Saviour. Deception will abound in these "last days". Make sure that you know the one and only True God, Jesus Christ. Place your faith and trust in him. He alone will give you eternal life. You are saved by the Grace of God and not by your righteous works. The belief that you can become a God is a lie from the dark side, Satan. As Jesus was sitting on the Mount of Olives, the deciples came to him privately. "Tell us," they said, "When will this happen, and what will be the sign of your coming and of the end of the age?" Jesus answered, "Watch out that no one deceives you. For many will come in my name, claiming, 'I am the Christ', and will deceive many." Matthew 24:3-5. There is a spiritual battle going on. It is constant. Satan uses various deceptive techniques including pride and greed to lead many souls astray. His greatest wish is to keep you from entering eternal life. He will do everything in his power to lead you astray, down the wrong path including believeing a lie. Pray for wisdom that you are not lend astray by false beliefs. In Jewish history, in Jerusalem, there were different gates inside the city walls. One such gate was called the Sheep Gate, and it was used specifically to bring in the sacrificial lambs inside the walls and into the temple. (Neh 3:1) It was the only gate that the Priests sanctified. 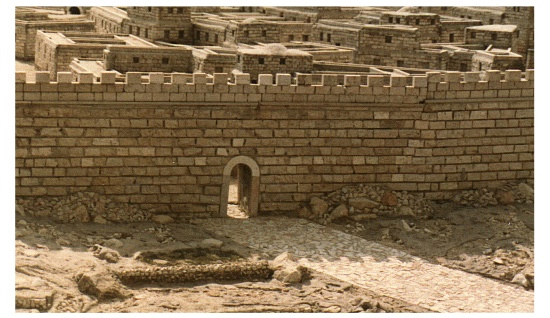 Notice in the model picture how narrow and small the gate was. This is the perfect example of salvation that the Lord uses, Jesus being both the door (gate) and the sacrificial lamb. We are his and his alone, justifiably saved by his grace and sacrifice on the cross, not by our striving to become God through some secret knowledge or ritual to become perfect. We are born into sin and therefore cannot become perfect no matter how hard we try. This is due to our sin nature inherited from the first man and woman, Adam and Eve. He knows our name, he knows the number of hairs on our head, he knows what we’ve been through and overcome. He is our good shepherd who never loses one of his own. We arrived by the narrow gate and are held securely in his hands. This is the Lord's version of a gated community where Satan cannot enter.